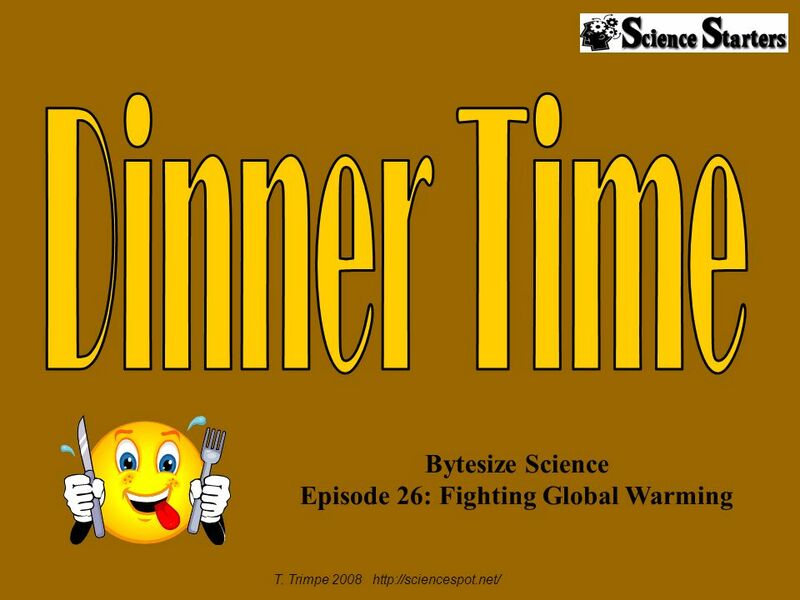 T. Trimpe 2008 Bytesize Science Episode 26: Fighting Global Warming. 2 1. How often should we eat chicken, fish, and vegetables in place of red meat order to help the environment? 2. What causes global warming? 3. 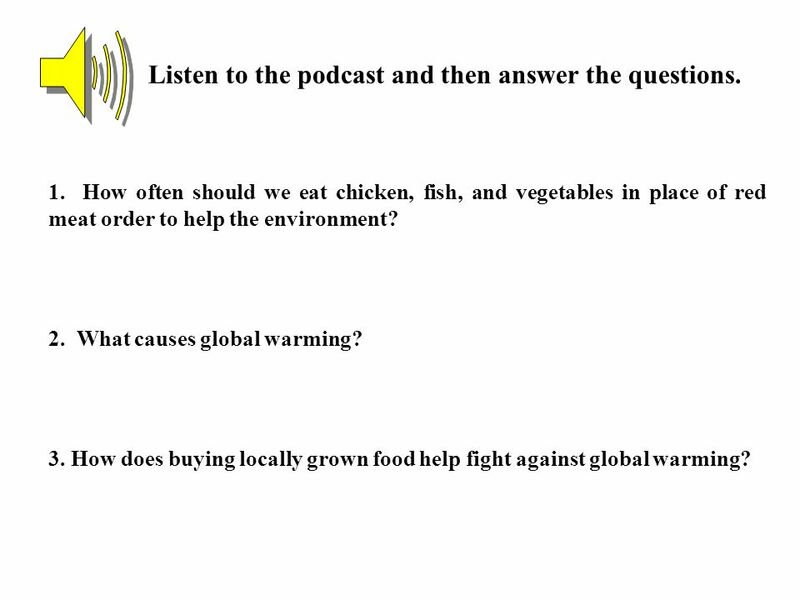 How does buying locally grown food help fight against global warming? Listen to the podcast and then answer the questions. 3 1. How often should we eat chicken, fish, and vegetables in place of red meat order to help the environment? 2. What causes global warming? 3. How does buying locally grown food help fight against global warming? 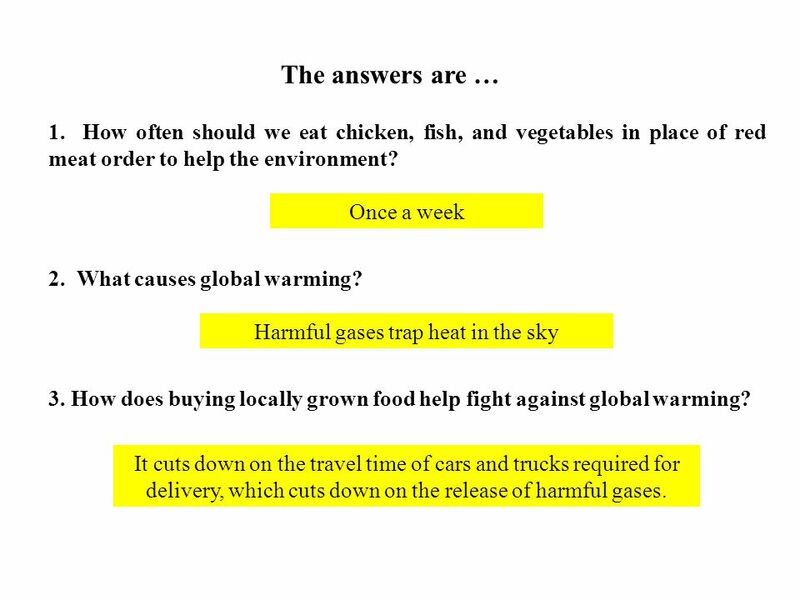 The answers are … Once a week Harmful gases trap heat in the sky It cuts down on the travel time of cars and trucks required for delivery, which cuts down on the release of harmful gases. Download ppt "T. Trimpe 2008 Bytesize Science Episode 26: Fighting Global Warming." C Words T. Trimpe Can you unscramble all the words below? Hint: They all start with the letter C. R A B C N O1. Im an element. T Words T. Trimpe Can you unscramble all the words below? Hint: They all start with the letter T. B L A T E1. Im full of. M Words T. Trimpe Can you unscramble all the words below? Hint: They all start with the letter M. N G E M A T1. Im attracted. L Words T. Trimpe Can you unscramble all the words below? Hint: They all start with the letter L. D I L Q U I1. Im not a.